Aim: To confirm claimed additional efficacy of Sensodyne Expert tooth brush over other commonly used commercially available tooth brushes. Methods and Materials: This was a single use randomized double blind study for the assessment of plaque remaining after tooth brushing with Sensodyne Expert tooth brush to that remaining after brushing with the. Forty subjects were enrolled in the study. 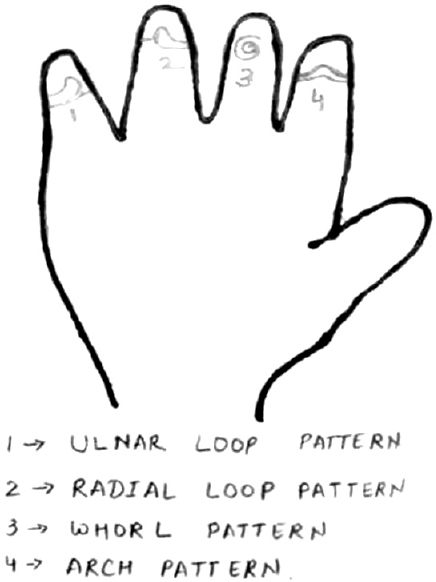 Only the right-handed subjects were chosen for the study. One side of the subjects' oral cavity was randomly assigned to be brushed with Sensodyne Expert toothbrush while the other was brushed using the already in use subject's regular tooth brush for one minute each side. 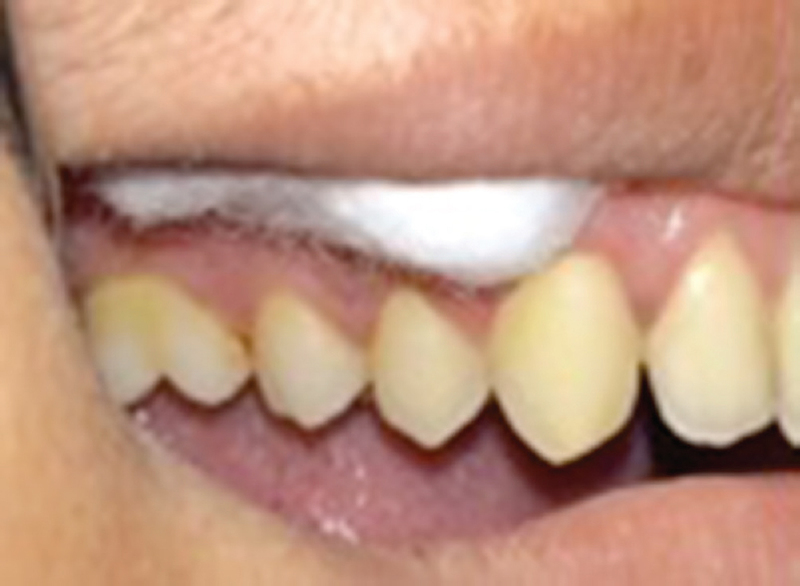 Two tone disclosing agent was then used to identify and score post-brushing plaque remaining after tooth brushing on the selected teeth. Plaque was scored using the Turesky et al. Modified Quigley-Hein Plaque Index (TQHPI) on selected teeth on both sides of the oral cavity. Results: The mean post brushing plaque score for assessed teeth brushed with Sensodyne Expert tooth brush was 1.283 ± 0.39, while that with already in use subject's regular tooth brush was and 1.153±0.71. Student t-test was used for analysis of results. There was an nonsignificant difference in post brushing plaque scores of both groups at assessed p value (P = 0.078). This suggests that subjects of this study were able to equally effectively remove plaque using their own and Sensodyne Expert tooth brushes. Conclusion: The plaque removing efficacy of Sensodyne Expert tooth brush was comparable to that of other tooth brusheswhen plaque on the selected teeth remaining after tooth brushing was assessed. Additional plaque removing efficacy of Sensodyne Expert tooth brushover subjects' other already in use toothbrushes was not found. Aim and Objectives: A study on prevalence and associated etiological factors of ECC. This study aimed to find the prevalence of ECC and the associated factors among preschool children in Anoo village, Hamirpur district (H.P). Materials and Methods: A sample of 65 children of age between 1 to 5 years was selected from anganwadi units of Anoo village. Dental caries was recorded and information regarding risk factors for caries was obtained through a questionnaire given to mothers or caretakers. Result: The prevalence of ECC was 55.38% and there was a strong association of ECC with some of the risk factors studied. Conclusion: The study emphasizes the need of dental health programs in preschool children. Increasing the awareness regarding maintaining good oral hygiene and encouraging the intake of healthy snacks in children can reduce ECC in concerned population. Background: Dental caries is the predominant cause of tooth loss in children and young adults. Mutans streptococci are the principal etiological agents of dental caries, of which Streptococcus mutans (SM) and Streptococcus sobrinus are most important in terms of human caries. Genetic factors also contribute to dental caries of which dermatoglyphics is one. Aim: The aim of the study was to explore the unique relationship between genetic component (dermatoglyphics) and dental components (dental caries, salivary pH, SM level) and to identify children at particular risk of dental decay. Settings and Design: One hundred children, 6–12 years of age, were selected and divided into two groups: Group 1 (children with dental caries, subject group) and Group 2 (children without dental caries, control group). Methods: Dermatoglyphic patterns were recorded using a digital scanner (CanoScan LiDE), and dental caries status was recorded with “decayed-extracted-filled teeth” index for primary teeth and “decayed-missing-filled teeth” index for permanent teeth. Salivary pH was determined using pH meter strips. SM level was estimated by microbial culture of collected saliva samples. Statistical Analysis: Mann–Whitney test, Wilcoxon test, and Z-test were applied. Results and Conclusion: (1) Subject group had a decreased frequency of loops, whereas control group had increased frequency of loop pattern on palmer digits (P < 0.001). (2) Subject group had a low salivary pH toward normal and control group had high salivary pH values toward normal (P < 0.001). (3) Subject group had high SM level as compared to control group (P < 0.001). Therefore, there exists a relationship between genetic component (dermatoglyphics) and dental component (dental caries, salivary pH, and SM level). Introduction: In orthodontics and dentofacial orthopedics, a thorough knowledge of the skeletal and dental components that contribute to Angle's Class II Division 1 malocclusion is essential because these elements may influence the approach to treatment. 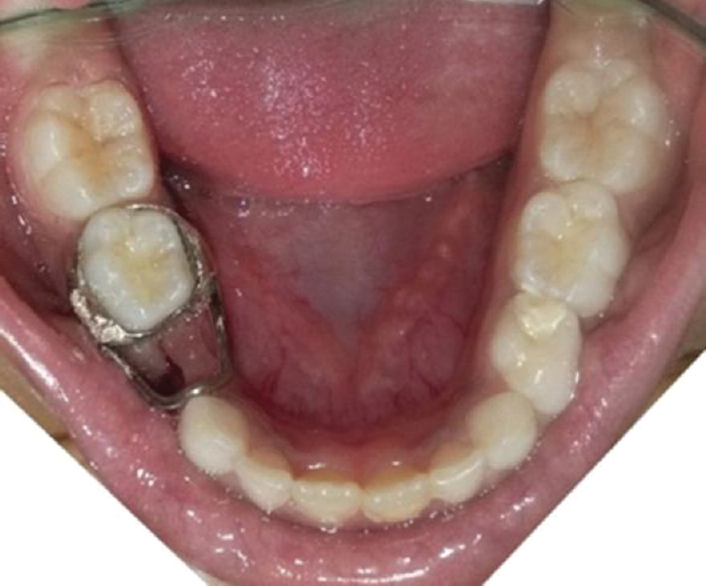 Orthodontic treatment planning is greatly influenced by prediction of mandibular growth pattern. The purpose of this study was to compare and correlate between antegonial notch depth, symphysis morphology, and ramus morphology in different growth patterns in Angle's Class II Division 1 malocclusion. Objective: (1) To compare antegonial notch depth, symphysis morphology, and ramus morphology in different growth patterns in Angle's Class II Division 1 malocclusion. (2) To find a correlation between these factors in different growth patterns in Angle's Class II Division 1 malocclusion. 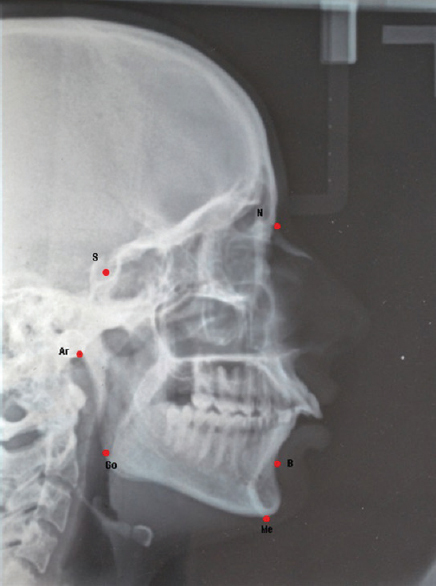 Materials and Methods: In this study, lateral cephalograms of total 90 patients (43 males and 47 females) with Angle's Class II Division 1 malocclusion patients were traced. The sample was divided into average, horizontal, and vertical growth pattern based on jarabak's ratio. Antegonial notch depth, symphysis height, depth, ratio (height/depth) and symphysis angle, and ramus height and width were evaluated and analyzed statistically. Results: A significantly high proportion of subjects were having lesser ramus height and ramus width in vertical growth pattern than horizontal growth pattern in Angle's Class II Division 1 malocclusion with sexual dichotomy in favor of males. The correlation coefficient within groups was calculated. In horizontal growth pattern, antegonial notch depth was correlated with anterior facial height, posterior facial height, and ramus height. In vertical growth pattern, antegonial notch depth was correlated with ramus height. In horizontal growth pattern, symphyseal height was found out to be correlated with anterior facial height, posterior facial height, ramus height and width. Symphyseal depth was also found to be correlated with ramus width, ramus height was correlated with symphyseal depth and symphyseal angle in horizontal growth pattern. Conclusion: The antegonial notch depth, symphysis morphology, and ramus morphology are significantly correlated with different growth patterns in Angle's Class II Division 1 malocclusion but was highly significant in horizontal growth pattern. Background and Aim: Diabetes has emerged as a major healthcare problem in India. Diabetes and periodontitis interact in a bidirectional manner; therefore, there is a need to screen patients for diabetes in dental clinics. Development of an intraoral blood sampling technique would make screening easier for dental practitioners. Routine oral examination of patients with periodontal inflammation with or without diabetes produce ample bleeding which can be used in glucometers for screening diabetes mellitus. Therefore, the aim is to assess if gingival crevicular blood (GCB) is as efficient as capillary finger prick technique in estimating the glycemic status. Settings and Design: This was a cross-sectional study. 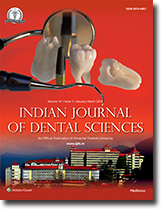 Materials and Methods: Fifty-eight participants with gingivitis or periodontitis with bleeding on probing from at least one site were chosen. Periodontal parameters such as Probing pocket depth and gingival index were measured using William's graduated periodontal probe. GCB and capillary finger prick blood (CFB) were collected for the estimation of blood glucose with the help of glucometer. Statistical Analysis: Performed using Pearson's correlation coefficient. Results: The Pearson correlation coefficient of GCB and CFB was 0.982 with a P < 0.001. Conclusion: It can be concluded that GCB can be used for the estimation of glycemic status. 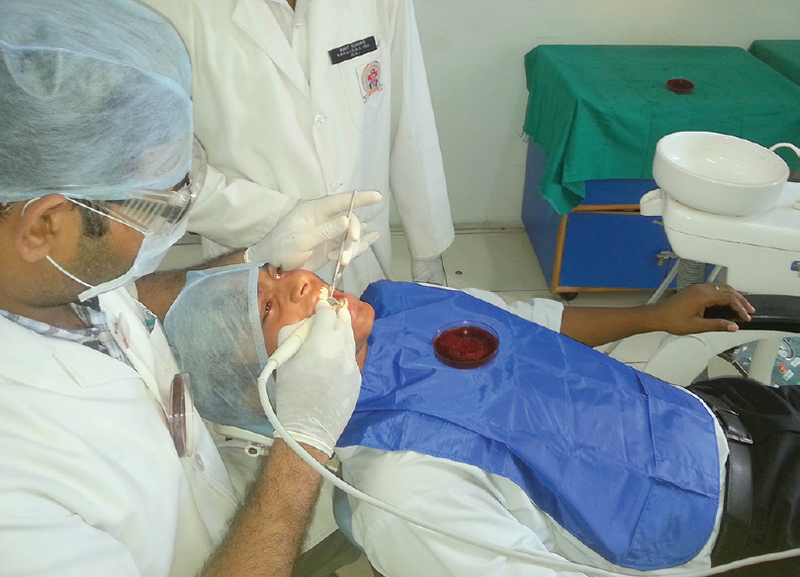 Background: Impressions are an integral part of prosthodontics. Elastomeric impression materials are the impressions materials of choice in fixed prosthodontics for its better surface detail reproduction. Out of the elastomers available, vinyl polysiloxane represents the state of art impression material in prosthodontics, but even these materials cannot give an accurate reproduction of the tissues if there is separation of impression materials from the tray which may results in a distorted impression leading to poor final restorations made from such impressions. Hence, tray adhesives need to be applied to the tray to obtain an accurate and consistent impression. The purpose of the study was to evaluate the compatibility of three different impression materials to three different tray acrylic materials using tray adhesive, by determining the tensile bond strength. 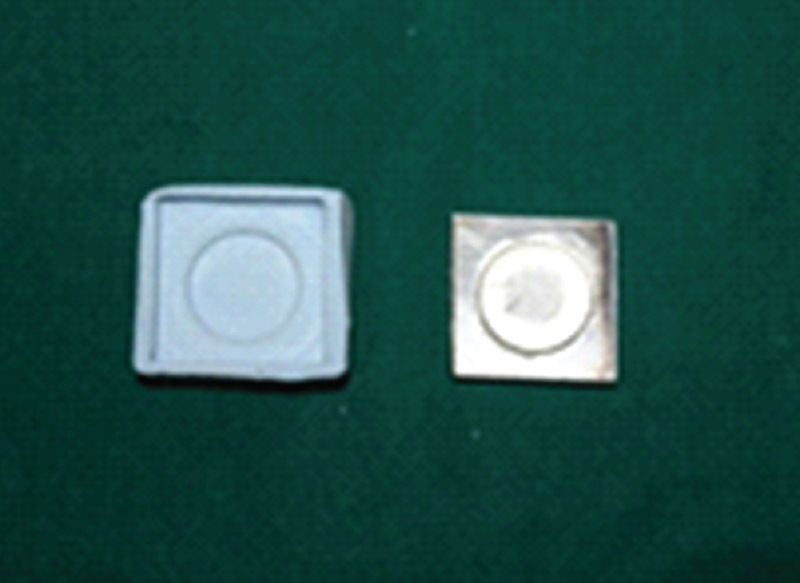 Materials and Methods: Two acrylic discs were utilized to make one impression sample of 3 mm thickness. The dimension of each acrylic disc was 2 mm in thickness and 2 cm in diameter. Specimens were made using a standard stainless steel die of the above-mentioned dimensions. A total of 135 specimens were prepared which included 15 samples in each category of nine groups. The samples were subjected to tensile bond strength testing using the universal testing machine and the values were recorded. All the values were subjected for statistical analysis. Results: Impregum (3M) specimens had demonstrated the highest tensile bond strength value (51.60N). Statistical analysis was done using Tukey's post hoc test and one-way ANOVA. Highly Statistical significant results were evident in Impregum (3M) and Indentium, as the P = 0.00. Conclusion: In this study Impregum (3M), specimens had highest tensile bond strength values compared to the other Groups followed by Indentium. 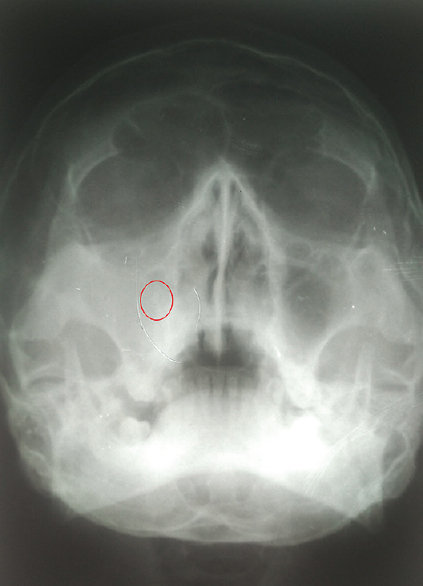 Rhinolith is a calcareous secretion that occurs in the nasal cavity and is usually discovered during routine radiographic examination as it is rare, unilateral, and asymptomatic. It can sometimes lead to nasal obstruction, fetid odor, and purulent secretion. This case report is about the accidental finding of rhinolith during conventional diagnostic procedure. 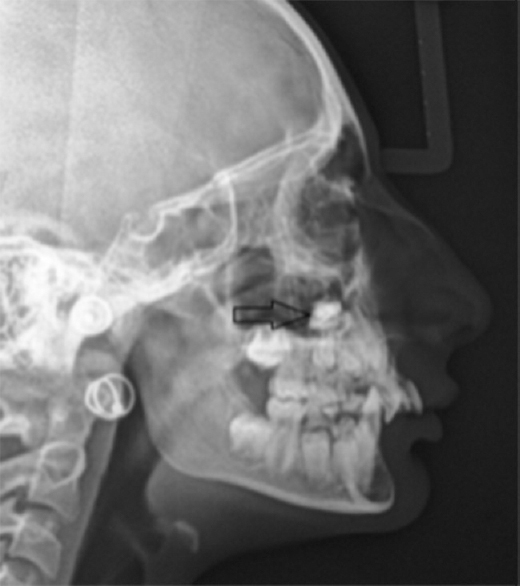 A 10-year-old female had an ovoid radiopacity in the right side of the nasal cavity. Although the patient had no symptoms of prevalence of this mass, it was found during routine radiographic examination. After the complete investigation of the radiopaque mass with the help of cone-beam computed tomography, the rhinolith was endoscopically removed. Oral carcinoma is one of the most prevalent cancers and one of the 10th most common causes of death worldwide. Oral squamous cell carcinoma accounts for nearly 90% of all oral carcinomas. Squamous cell carcinoma is the malignant neoplasm of mucosal origin. The etiology of squamous cell carcinoma is multifactorial. The use of tobacco and betel quid, heavy alcohol drinking, intake of diet low in fresh fruits and vegetables, viruses, trauma, and genetics are considered as possible risk factors. Early diagnosis of oral squamous cell carcinoma plays an important role in improving prognosis and reducing morbidity and mortality associated with it. It can be managed by surgery, chemotherapy, radiotherapy, or combination of all these, but regardless of its treatment modality, the 5-year survival rate is poor at about 50%. 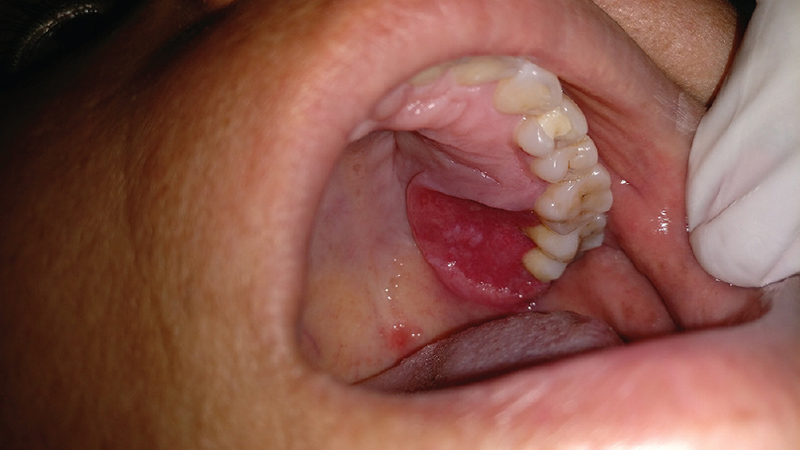 This case report demonstrates a case of oral squamous cell carcinoma induced by Chewstick trauma with a history of no deleterious habits and is confirmed by clinical and histopathological examination. Procurement for high standard of oral hygiene is a cardinal requirement for any individual and dentists constantly aim to provide optimal treatment to their patients. However, when it comes to treat patients with immunocompromised diseases, particularly those attached with social stigma like AIDS/HIV, there remain doubts and hesitations. This may lead the dentists to break the ethical responsibility by abjuring or not providing adequate treatment to these patients. Such situations can easily be avoided with absolute knowledge and awareness among the oral health-care providers including prosthodontist regarding the disease process, its connotations and measures to be taken during their treatment. This article summarizes the fundamental points in the prosthodontic management of immunocompromised patients which in the opinion of the author may be easily consolidated in dental practice. Tooth-derived bone graft material, which is proved to be rich in bone growth factors and bone morphogenic proteins (BMPs), have been becoming a practical substitute to bone grafting. It can also be used as a carrier for growth factors and stem cells as reported in many recent studies. Autogenous-tooth bone grafting technique is significant as this biomaterial has excellent bone regeneration capacity and also relatively non-existent chances of antigenicity, genetic diseases and disease transmission. 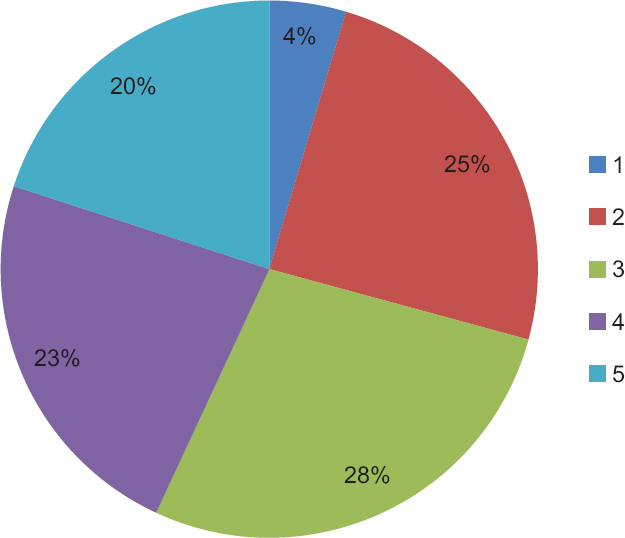 In this article, a broad overview of the published findings with regard to the properties and uses of tooth-derived regenerative bone grafting is discussed.